Indium Corporation Talent Acquisition Supervisor Jim McCoy speaks to a group of students. Indium Corporation, Utica’s Technology Company®, will showcase its breadth of manufacturing careers through an interactive display at this year’s SUNY Poly Manufacturing Day Expo to be held on Oct. 6 at SUNY Poly in Marcy, N.Y. This event, which will take place from 9 a.m. to noon at the Wildcat Field House, is part of a national initiative with activities held throughout the month all around the country. These activities are designed to enhance awareness of manufacturing careers and their value to the local, regional, and national economy. “We’re looking to inspire the next generation of manufacturing leaders and the community with the knowledge that sophisticated manufacturing happens every day right here in the Mohawk Valley at Indium Corporation,” said Jim McCoy, Indium Corporation’s Talent Acquisition Supervisor. 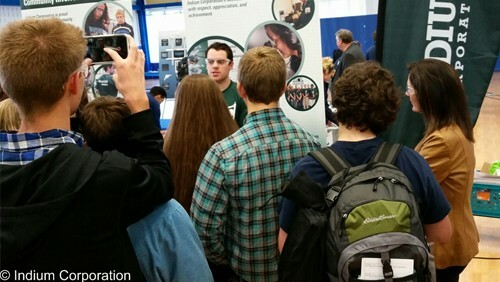 In addition to sponsoring the expo, Indium Corporation actively participates with students, teachers, and administrators throughout the region to encourage and enable every student to explore STEM education and careers. This includes delivering presentations, hosting tours, and maintaining one of the area’s largest and most sought-after summer college internship programs.